As the days get colder, we see fog-draped lakes at dawn. This is caused by the temperature of the water being higher than that of the air. This scene conjures up an ethereal, otherworldly sense. 'Fuyugomori' is best translated as 'hibernation' in most cases. Walking through a mountain in winter, you can imagine little animals tucked away in caves and nestled into pockets of the mountain, curled up in hibernation. Humans, too, spend much of the winter confined inside. 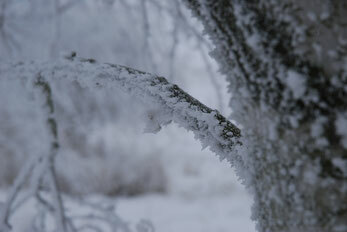 Muhyō (mu = fog, mist; hyō = ice) is the phenomenon of fog forming icicles on trees when the temperature drops to freezing. It can also refer to semi-translucent ice that has formed on trees and rocks. Muhyō in the morning sunlight is especially beautiful. ‘Ginchiku’ literally means 'silver bamboo' and is a poetic description of the icicles that form from dripping water from eaves, rocks, and tree branches. 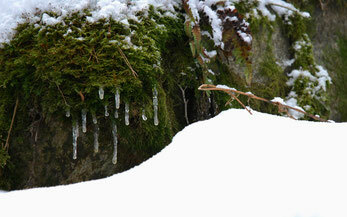 In Japanese the usual word for icicle is ‘tsurara’ and written 氷柱. In the past, in summer people would place long blocks of ice in rooms of their house to cool rooms down. These were also written 氷柱 but pronounced ‘hyōchū’. 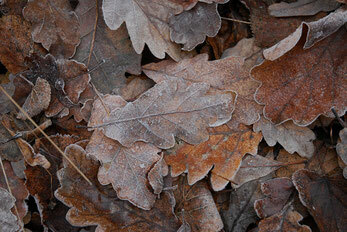 In late autumn when a frost turns leaves black, the black withered leaves are referred to as ‘shimogare’. The howling noise of the winter wind as it blows through bamboo gates and fences. 'Mogari' means bamboo fence and 'bue' means whistle. It's as if the rickety fences have been transformed into musical instruments. In the past, kuchibeni (red lipstick) was made from the beni flower and sold in small sake cups. The kuchibeni made in cold weather was considered the best quality. The very best kuchibeni was that sold on the day of the ox in winter (nowadays the end of January in Japan). This kuchibeni was also said to prevent ulcers. Kamado = cooking stove; neko = cat. ‘Kamado neko’ refers to a cat sleeping in the warmth of a cooking stove in the winter. 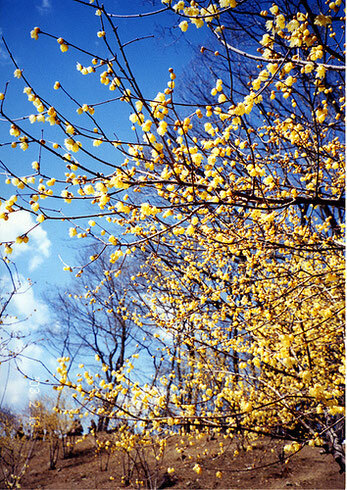 The Rōbai, also known as ‘Karaume’ is a deciduous tree shrub that blossoms in yellow flowers with a magnificent perfume in December (also know as ‘Rōgetsu’ or ‘Month of the Rōbai’ in China and Japan). The ume blossom is a relative of the Rōbai. 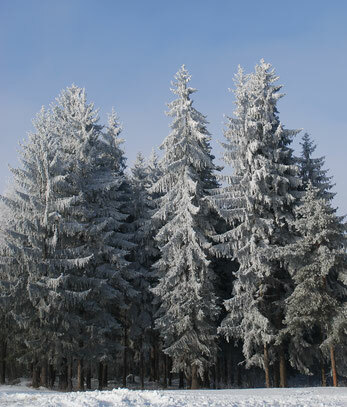 寒 kan = cold, 松 shō = pine. 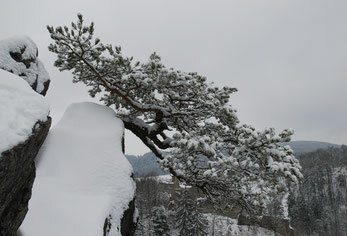 Kanshō refers to the sight of evergreen pines in the depth of winter. 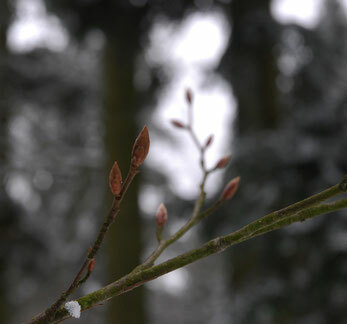 The ‘Three friends through the cold’ are the pine that never loses its green, the tall and supple bamboo, and the ume blossom that is the first flower to bloom at winter's end. These three plants are especially revered in Japan. The evergreen pine also lives a long life, and is a symbol of longevity. Kare = withered; ashi = reed. ‘Kareashi’ is the seen of withered reeds. 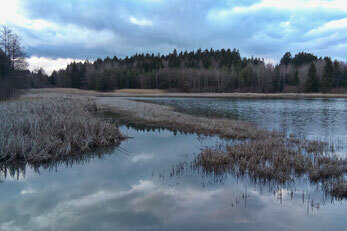 In the winter the water level of rivers reduces and the dry skeletons of reeds rustle in the cold wind. 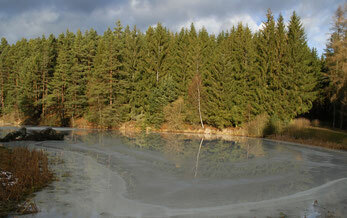 Hatsugaori is the first freezing over of a pond or body of water for the winter. Going outside in the early morning and seeing a thin layer of ice frozen over a pond invokes a deep realisation winter is here. “Yukizora” refers to the look of the sky just before it is about to snow. Looking up to the yukizora showing signs of a silent, steady snowfall, one feels the bitter cold as one also feels the beauty of a snow-covered landscape and falling snow crystals from the sky. At the begging of summer, new foliage of the lotuses rises to the surface of the pond. In the height of summer, strong stems hold big, brilliant green leaves up above the waterline. With the autumn winds, the green starts to fade and the leaves become tattered. 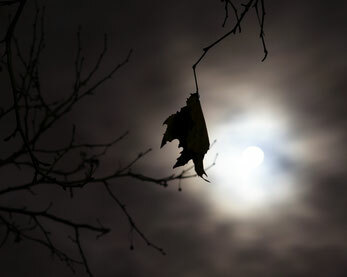 As the autumn deepens and entering winter the leaves wither and stems fold and break making a desperate sight. 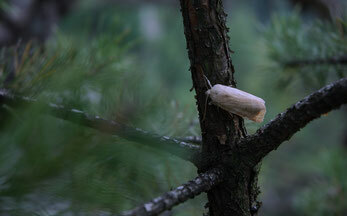 Picture a winter butterfly, perched stiff on a tree branch like an icicle too cold to fly. This is 'itecho'. Shikimatsuba refers to the pine needles that are laid on the roji garden or Japanese gardens during the winter to protect the moss and other plants from the frost and snow. The needles are always aged amber/brown pine needles, used for their beauty. Heading home on a winter’s night, one’s path is sometimes lit by the cold but brilliant silver light of the moon. 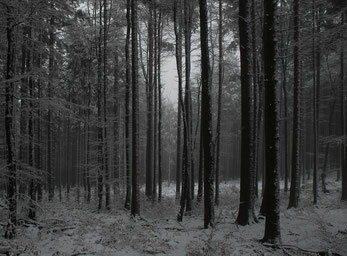 Such a scene is piercingly cold, but holds a unique beauty. “Winter moon, crossing this bridge alone, the sound of geta”. Here “kangetsu” is represented by “winter moon”. A single person crosses the bridge as brilliant light from the winter moon fills the scene. This moon lights up the frost covering the planks. And the sound of this single person’s geta rapping over the planks resounds through the cold winter night. Satokagura refers to the tradition of performing Kagura at local shrines across Japan in November of the lunar calendar. It is distinguished from the Kagura performed at the Japanese Court in December called ‘Mikagura’. ‘Kamiasobi’ was the word used to refer to Kagura in olden times. Local kagura lights up mid-winter Japan. As nature is at its darkest of the year, kagura performances enrich the hearts of whole communities, reminding them there is a vast world of mystery still working, though the world seems dormant in the cold. 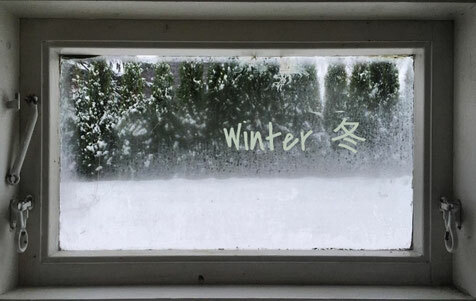 December is also called ‘臘月’ (rōgetsu). 八 hachi = eight. Therefore 臘八 ‘rōhachi’ is December the 8th, the day it is said the Buddha attained enlightenment during a harsh, long period of meditation. To commemorate this, in Zen temples in Japan from the first until the morning of the eighth of December, an intense period of zazen is conducted without sleep nor rest. This period of zazen is called ‘Rōhachi Sesshin’. An ‘uzumibi’ is the smouldering fire buried in the hearth to make sure the main fire of the hearth burns strong. In a chaji conducted at New Year’s, on New Year’s Eve an uzumibi is buried in the hearth, and kept smouldering overnight. Then on New Years day the water for the first bowl of tea for the year is boiled from a fire started from the smouldering remains of last year’s fire. 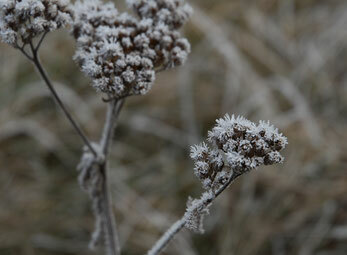 Hyōka refers to when water droplets on plants freeze overnight and appear as white flowers. 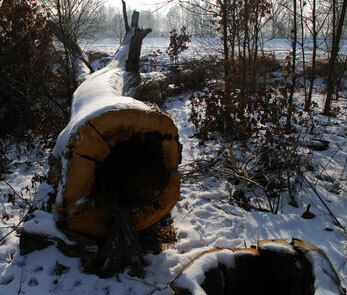 Not written but implied in the words is the contrast between a seemingly dead winter tree and the living scent that bursts out of the tree when wounded by an ax. There is a feeling of awe in this haiku. Awe for nature that keeps pulsing right under our noses. 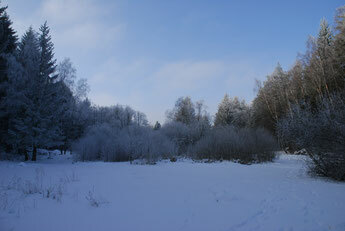 In the night before a frost, it’s as if you can hear the frost in the heavy, frozen ambience. This is the ’song of frost’ or ‘shimo-no-koe’. 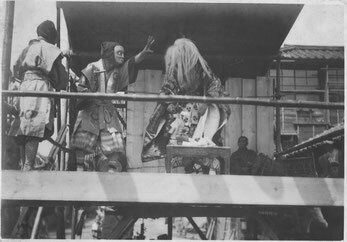 “The Potted Trees” is a very old noh play attributed to either Kan’ami (1333-1384) or Zeami (1363?-1443?). 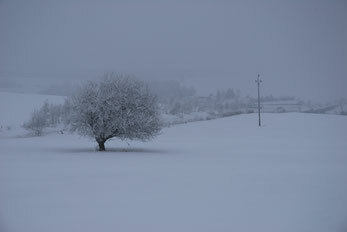 The play is set in winter. The regent of Kamakura, Hôjô Tokiyori, is traveling incognito as a priest. He seeks shelter from snow at the house of a man named Tsuneyo, the former lord of the Sano fief, now in poverty. The chorus sings for Tsuneyo, saying the cold winds keeps him awake so he cannot even dream of better days. 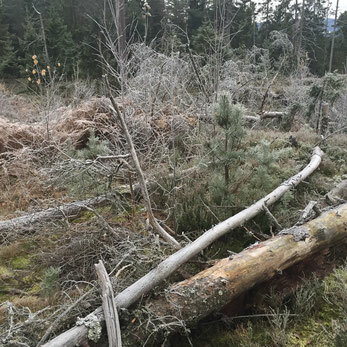 Noting the particularly cold night, Tsuneyo offers to make a fire by cutting his only possible firewood - his potted trees of plum, cherry and pine which he has kept from better times. He sadly cuts them down, places the branches in front of his guest and starts a fire. Tokiyori does not reveal himself, but when he returns to Kamakura, Tokiyori returns Tsuneyo’s lands and gives him three estates for the three trees he ungrudgingly gave up - a plum field, a cherry-tree field and a pine forrest. Tsuneyo takes the deeds to these lands and returns home in joy. Link to synopsis of the play. In the mountains, the firm, young buds and new sprouts of the trees become suppler and new leaves start to appear. As well as green shoots, beautiful reds and soft yellow shoots emerge and before long, the notes of a coming spring are resounding all around. This mei is filled with a sense of hope. For many people, the crisp, yet sweet fragrance of the ume in fields and gardens hails the dawn of spring. The ume trees stir excitement in the hearts of people when they come into bloom. From the umeboshi (pickled sour plum) that adorn dinner tables, to ume designs seen on boxes and on traditional clothing, the ume is a subtle, but profound part of the lives of at least the Chinese, Koreans and Japanese. Can snow be falling from the heavens? Fuyu = winter, kasumi = mist, haze. 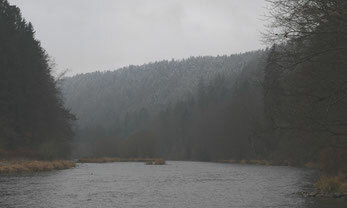 This mei refers to the haze that hangs in winter, wrapping all things in a ghostly cloud as if giving form to the bitter cold. Asa = morning, yuki = snow. 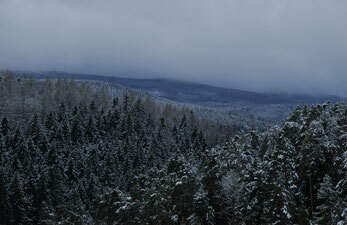 Asayuki is the scene of fresh snow laying in the morning.